Today we take a look at the in-game modding tools that will allow you to make your own scenarios in That Which Sleeps. I'm in the process of moving to Texas and it sure is hot here, and because of that I didn't really have time to make any of the videos I wanted. Instead, I figured I'd show some screenshots of our in-game Editor, the same Editor we use to make the scenarios that will be released at launch. When you load up your gallery of scenarios you can click on "Edit" to jump into the in-game editor. The in-game editor has three modes which you alternate by clicking the button at the top. 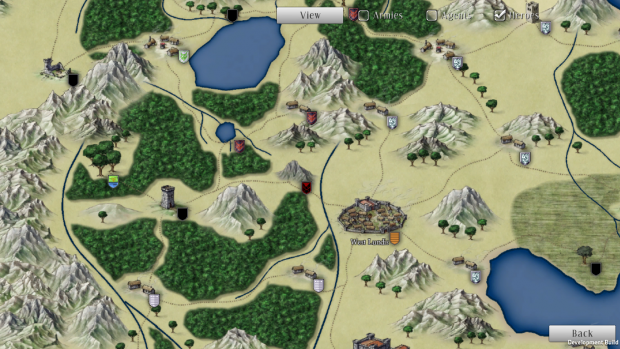 View - Strips away all the excess and lets you simply look at the map, as well as opening up in-game menus the same way a player would see them. Edit - This is where you flesh out your world, adding Old Ones, Champions,Cultures, Events, as well as editing POIs. View Mode lets you see the world as the player would, opening up menus and making sure that everything you've added makes sense. 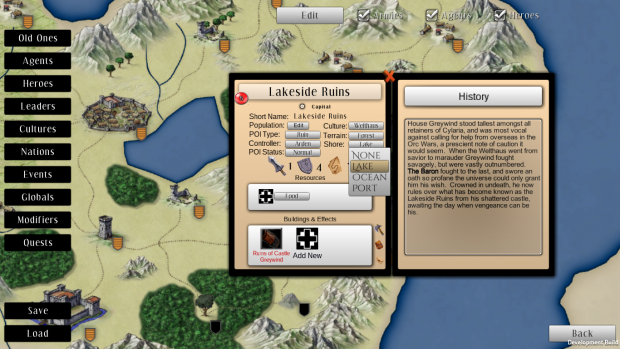 Notice the checkboxes at the top which allow you to show or hide various entities on the map. 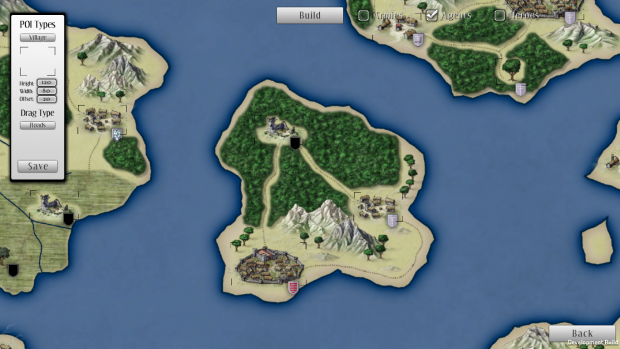 The Build screen let's you drag and drop POIs of varying type/size onto the map. The height/width determine the collider box for clicking on the object, and the Offset determines how far from the collider to put Agents/Heroes/Armies. Drag Type allows you to select between a few convenience modes, one of them for importing and dropping in Background Images to serve as the map, another for Roads where you can just click and drag between POIs to make connections, and finally Naval which is currently still being tweaked. Edit is where most of the work happens, and it has a lot of screens to accomplish the heavy lifting. Where possible, as above, we've tried to mimic the appearance of the player's view for the data, so that if you now clicked on Edit above it would shift to view and you could immediately see how our changes looked. The data points are mostly either Input Boxes with simple validation or Drop Down Lists populated by global settings. In the picture above we are editting a POI as are selecting from the Shore information, which is a global variable that you access underneath the Globals menu to add another value. All of these variables are accessible in the Quests, Modifiers, and Events section so you can, with some work, tie it together to make a truly unique scenario experience. Customization isn't limited just to the World elements like Leaders, Nations, and Cultures - you can also create Unique Old Ones for your world, or even large Quests that heroes will go on mimicking plots from books, movies, or your own DND campaigns (which is really where most of our ideas came from). The interface is still a little clunky right now, but unless we start running into showstopping bugs we anticipate we will release the editor with the first beta release to our kickstarter backers or steam early access users. The faster we can get these tools into your hands, the faster you can start making the amazing mods we know That Which Sleeps is capable of. Progress Update - We've slowed down a bit since I moved to Texas, but we're back on prepping the Gameplay Videos in anticipation of our Kickstarter. Follow us if you want to keep up with the latest news.